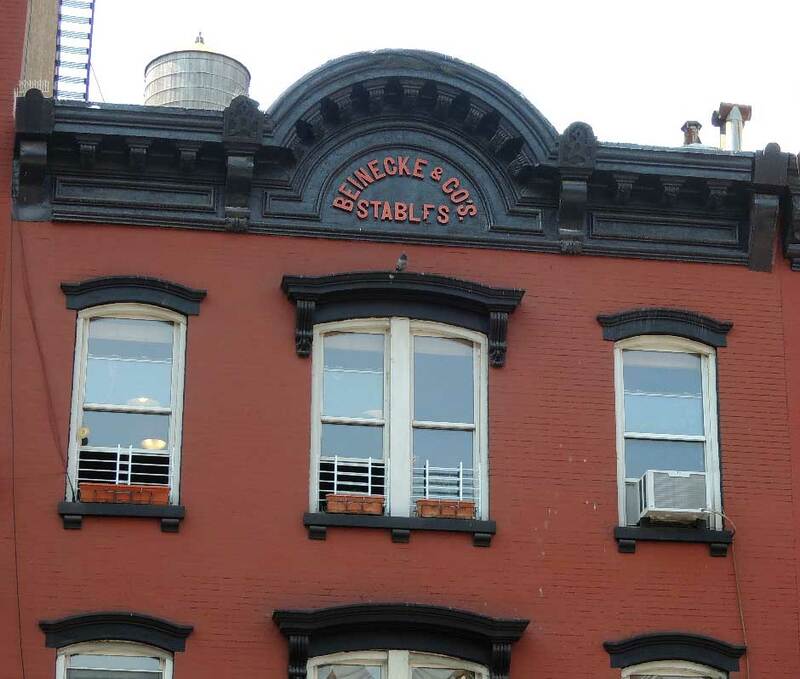 Beinecke & Co., Butchers, maintained a stable here at 33 Great Jones St. circa 1902 to 1925. The company was first listed in New York city directories in 1872 and continued as Beinecke Meat Co. in New York City until 1990. Bernhard Beinecke's obituary, New York Times, 21 Dec. 1932, read, "Bernhard Beinecke, retired hotel operator, banker and meat packer, who was chairman of the Hotel Plaza, died yesterday in his eighty-seventh year in his apartment in that hotel after an illness of several weeks. He leaves his wife, the former Johanna Weigle, with whom he celebrated their gold wedding seven years ago; four sons, Edwin J., president of the Sperry & Hutchinson Company; Frederick W., Walter of this city, and Bernhard Jr. of Monrovia, Cal., and two daughters, Mrs. Edwin A. Strong of this city and Mrs. Fritz Weickert of Leipzig, Germany. Mr. Beinecke was born in 1846 in Germany and came to New York in 1865. Shortly afterward he formed the firm of Beinecke & Co., which soon became one of the largest wholesale meat concerns in this city. On the merger of this company with the Eastman Company, Ltd., in 1890, he assumed the presidency of the latter company, which for many years maintained at Fifty-ninth Street and the Hudson River the largest stockyards in New York. One of the founders and original directors of the old Plaza Bank, Mr. Beinecke was also one of the early directors of the Germania Bank, afterward changed to the Commonwealth Bank, of which he became president, and finally chairman of its board of directors, until its merger with the Manufacturers Trust Company. He was one of the pioneers in the modern phase of the hotel business, organizing one of the first chains of hotels in this country. With his associates he formed the Hammond Hotel Company, which operated the old Plaza and Murray Hill Hotels in New York, the old Shoreham Hotel in Washington and Hygeia Hotel at Old Point Comfort, Va., and the Essex Hotel in Boston. He subsequently was instrumental in establishing and erecting the Hotel Manhattan and the present Plaza Hotel in New York and the Copley-Plaza Hotel in Boston. He was the president of the companies that built these hotels, until his retirement, remaining as chairman of the board of the Plaza Hotel. The funeral services will be held in the Church of the Divine Paternity, Central Park West and Seventy-sixth Street, at 2 o'clock on Thursday afternoon." Quoting from the website Immigrant Entrepreneurship, "Bernhard Beinecke grew up in Elberfeld, near Wuppertal, Germany, before immigrating through Castle Garden to New York City in 1865. Only nineteen on arrival, he soon demonstrated his natural business prowess. Bernhard signed on as a wagon driver for a meat concern; within a few short years he bought the company and appropriately renamed it Beinecke & Company. The company’s growth, in turn, introduced Bernhard to New York society. On April 12, 1875, he married Johanna Elisabeth Weigle at the German Evangelical Presbyterian Church in Manhattan’s Lower East Side. He spent the next fifteen years gradually expanding and cementing his company’s position in the city’s vital meat packing industry. These efforts culminated with the 1890 acquisition of rival firms Ottman & Company and T. C. Eastman Company, Limited. Beinecke & Company assumed control of New York City’s largest stockyard, located along Fifty-Ninth Street and the Hudson River." This article continues, "Delivering meats to New York City’s major hotels, Bernhard quickly appreciated the opportunities awaiting him in this burgeoning market. In 1890, he purchased the (then-unfinished) Plaza Hotel on Fifth Avenue at the southeast corner of Central Park. Profits from the Plaza led Beinecke and his board to construct the Manhattan Hotel in 1896. By 1901, he decided to demolish and rebuild the still-young Plaza Hotel. With Harry S. Black, president of the George A. Fuller Construction Company and its parent company, the United States Realty and Improvement Company, and nationally recognized hotelier Fred Sterry (who became The Plaza’s first director), Beinecke tore down the fifteen-year-old building in 1905 and replaced it with a magnificent complex later described as 'the most elegant hotel in America.' Designed by the nation’s leading hotel architect, Henry J. Hardenbergh, creator of the Manhattan and Waldorf-Astoria hotels in New York City and the Willard Hotel in Washington, D.C., no expense was spared in building and furnishing The Plaza. Handmade Irish linen, French Baccarat-produced glassware, and carefully selected English oak panels were imported to recreate the 'effect of a French chateau.' The board of the United States Realty Trust Company, the Plaza Operating Company’s parent entity, included such leading financiers as James Stillman (National City Bank of New York, now Citibank), John W. Gates (affiliated with the Texas Company, now Texaco), Charles M. Schwab, and William F. Havemeyer. On its opening day, Alfred Vanderbilt signed the register book first; Bernhard and his family were the third. Within the first months, many of America’s elite family dynasties, from the Vanderbilts and George Gould to Benjamin Duke and Oliver Harriman, had taken up semi-permanent rooms in The Plaza. In only twenty-five years, Bernhard had transformed himself from a youthful immigrant into one of New York City’s most influential entrepreneurs. Over the next decade, he expanded his hotel empire, including the crosstown Savoy Plaza and Boston’s famed Copley Plaza. Under Bernhard’s direction, the Plazas became the first high-end hotel chain in the United States. The hotel chain’s success also deepened the Beineckes’ relationship with the Fuller Company. The Fuller Construction Company, founded in 1882, had established itself as the United States’ foremost builder of skyscrapers. Before constructing The Plaza, Fuller had already completed the New York Times building and the famous Flatiron skyscraper at 175 Fifth Avenue, Manhattan. In 1966, the Beineckes still held the largest share block in the construction firm that in New York City alone had gone on to build both Pennsylvania Station and the United Nations headquarters." Bernhard Beinecke's sons were also prominent in New York business, particularly Frederick W. Beinecke (1887-1971). Quoting www.immigrantentrepreneurship.org again, "Frederick W. Beinecke (born April 12, 1887 in New York City, NY; died July 30, 1971 in Great Barrington, MA) (known as 'Fritz' to family and friends) nurtured, along with his two brothers and lifelong business partners Edwin and Walter, The Sperry & Hutchinson Company (S&H) of New York City. The United States’ leading trading stamp company, S&H and their 'Green Stamps' redemption coupons became one of the most successful and recognizable symbols of post-Second World War American consumer culture. Their father, German-born hotelier Bernhard, instilled a strong sense of careful investment, corporate responsibility, and civic duty in his sons. Edwin, Fritz, and Walter were passionate rare book collectors who donated much of their personal wealth, collections, spare time and energy to furthering Yale University’s academic goals. Today, the architecturally stunning Beinecke Rare Book and Manuscript Library stands as one of the world’s greatest repositories of early and historic documents, images, and artifacts." Bernhard Beinecke's other sons were Edwin John Beinecke (1886-1970) and Walter Beinecke (1888-1958). Walter Beinecke's obituary, New York Times, 4 Sept. 1958, pg. 29, read in part, "Walter Beinecke, board chairman and chief executive officer of John C. Paige & Co., 111 Broadway, an insurance concern, died yesterday at his home, 920 Fifth Avenue, after a long illness. He was 70 years old. Mr. Beinecke also was a director and chairman of the finance committee of the Sperry & Hutchinson Company, 114 Fifth Avenue, which deal in trading stamps. At various times Mr. Beinecke had been an officer and director of the George A. Fuller Company, a construction concern; Austin, Nichols & Co., wine and liquor importers and distributors, and the Copley Plaza Operating Company, which operated The Copley Plaza Hotel, now the Sheraton Plaza, in Boston. He had been president of the 920 Fifth Avenue Corporation since it was formed in 1948. ... A graduate of Columbia Grammar School here and of Phillips Academy, Andover, Mass., Mr. Beinecke attended Yale University and Williams College. In 1948 he and his brothers established the Edwin J., Frederick W. and Walter Beinecke Fund for the purchase of books for the Yale Library. ... Surviving, besides the brothers, are his widow, Mrs. Katherine Sperry Beinecke; a son, Walter, Jr.; a daughter, Mrs. Carl Shirley, and five granddaughters." Edwin J. Beinecke's obituary, New York Times, 22 Jan. 1970, pg. 37, read, "Edwin John Beinecke, who became president of the Sperry and Hutchinson Company, the trading-stamp concern, in 1923, and remained as its chief executive under various titles until 1967, died yesterday in, Northern Westchester Hospital in Mount Kisco, N. Y. He was 84 years old and lived on Cliffdale Road in Greenwich, Conn. Mr. Beinecke was a director of 18 companies, but his life long business affiliation was with Sperry and Hutchinson, which became a Beinecke family concern when Frederick and Walter, two of three Beinecke brothers, married daughters of one of the organizers of the original partnership formed in 1896. Edwin Beinecke became chairman of the board in 1932 and held that title until 1960, when it was changed to chairman. He retired in 1967, but continued as a director. He was succeeded by a nephew, William S. Beinecke Jr. Mr. Beinecke guided the greatest period of the company's growth in the trading-stamp business. Its familiar green stamps are distributed by 65,000 retail stores in the United States, and redeemed for merchandise at 820 centers across the country. In addition to the difference in price between the stamps and the value of the premiums for which they can be redeemed the company generated funds from stamps that are never redeemed and the use of the sales price until the stamps are presented. Under the younger generation those funds have been used to buy subsidiaries, notably the Bigelow-Sanford Carpet Company and the State National Bank of Connecticut. At his death Mr. Beinecke was on the boards of the Hotel Waldorf-Astoria Company, the Manufacturers Hanover Trust Company, Tiffany & Co., and the George A. Fuller Company, a heavy construction contractor, among others. Mr. Beinecke was long a patron of the Yale University Library. The Beinecke Rare Book and Manuscript Library there was given in 1963 by the three Beinecke brothers and their families. Mr. Beinecke was an alumnus of Yale. Survivors are his widow, the former Linda Louise Maurer of New York; a son, Edwin, Jr., chairman of the finance committee of Sperry and Hutchinson; a daughter, Mrs. Sylvia B. Robinson of Easton, Md., a brother, Frederick, four grandchildren and seven great-grandchildren. A memorial service will be held Monday at 11 A.M. at the Episcopal Church of the Heavenly Rest, 2 East 90th Street. Burial will be private."